If you've always wanted to play the ukulele, this is where your journey begins. 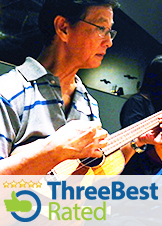 This essential module offers you a genuine opportunity to speedily pick up ukulele-playing aptitude. Right from the first lesson, you will be taught how to play a song. By the end of this 7-week module, you will be able to sing and play along to your favorite pop songs. The Story of Mankind - The Pre-Historic Age explores the early developments of humanity. Draw strength from the examples of early man as you witness the human spirit and will in action. Music has the power to affect our emotions and the way we see things. As you begin this journey, you will start to express yourself in a new way! In addition, all sessions are conducted in a class setting so you will get to meet people of the same passion, pursuing the same skill together with you! Our coaches also ensure you get personal attention in the midst of coaching the class as a group. We encourage you to come with an open mind and experience music with us!